ICMP Statistics provides an information about ICMP messages. 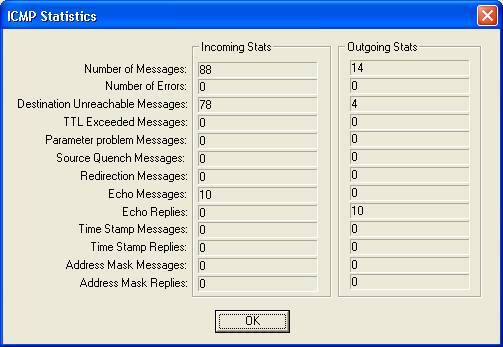 The dialog ICMP Statistics shows the details about ICMP messages in incoming and outgoing states including the number of messages , errors, unreachable messages, TTL exceeded messages, messages with parameter problems, source quench messages, redirected messages, echo messages, echo replies, time stamp replies, address mask messages, address mask replies. All fields are automatically updated for each received ICMP message.